Garage Italia and Gagosian are pleased to present « Blair Thurman – Nell’Acqua Azzurra », the first personal exhibition of the American artist in Milano. This unprecedented collaboration between Garage Italia and Gagosian is part of a long tradition of strong exchanges between art and automobile, from the Italian Futurist movement at the beginning of the 20th Century to contemporary artists like Alexander Calder, Roy Lichtenstein or Andy Warhol. Thurman’s influences range from Pop art and Minimalism to relics from childhood, popular music, and 1970s cinema. His standardized forms, pulled from slot-car racetracks, architectural frameworks, and found shapes from daily life take on a nostalgic register, the fascinations of boyhood working to render abstract geometries more idiosyncratic and accessible. Thurmantransposes the formal details of these everyday objects into the subliminal realm of abstraction. 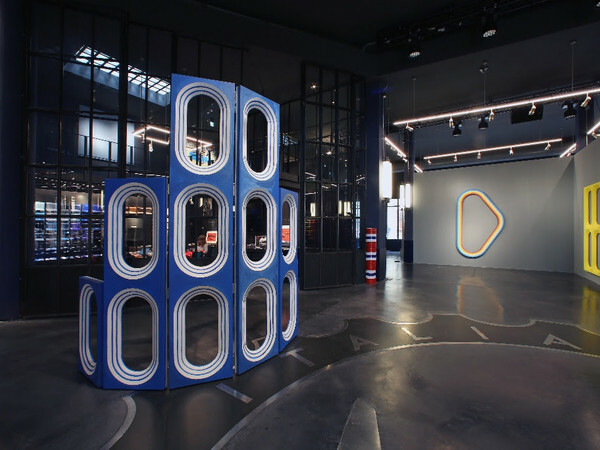 Lapo Elkann opened Garage Italia in Milan in November 2017 in the iconic former petrol station Agip Supercortemaggiore, restored by Michele De Lucchi. Creativity, Design and Italian Excellence gather together in the headquarters of this creative hub which also houses a cafe’ and a restaurant by Michelin Star Chef Carlo Cracco. Garage Italiaconceives and develops automotive and creative tailor made projects, products and unique experiences for brands, businesses and private customers. A real platform and unique concept where contamination between Motion, Art, Style are the core of what Garage Italia stands for. Larry Gagosian opened his first gallery in Los Angeles in 1980, specializing in modern and contemporary art. For almost forty years Gagosian has evolved into a global network with sixteen exhibition spaces in New York, Los Angeles, San Francisco, London, Paris, Rome, Athens, Geneva, and Hong Kong. Gagosian’s vibrant contemporary program features the work of leading international artists including Georg Baselitz, Jeff Koons, Takashi Murakami, Anselm Kiefer, Ed Ruscha, Richard Serra. Additionally, unparalleled historical exhibitions are prepared and presented on the work of legendary artists such as Francis Bacon, John Chamberlain, Helen Frankenthaler, Alberto Giacometti, Roy Lichtenstein, Cy Twombly, Andy Warhol, and others. A series of groundbreaking Picasso surveys curated by John Richardson has been attended by hundreds of thousands of visitors in New York and London. Blair Thurman was born in 1961 in New Orleans, Louisiana, and currently lives and works in New York. He received his B.F.A. from the Nova Scotia College of Art and Design, Canada, and his M.F.A. from the University of Massachusetts at Amherst. His work is featured in the collections of the Centre national des arts plastiques, Paris; Fonds régional d’art contemporain, France; and the Syz Collection, Switzerland. Recent solo exhibitions include Le Magasin - Centre National d’Art Contemporain, France (2014); and “Honeybadgers,” Oklahoma City Museum of Art, Oklahoma (2015). Thurman’s work was included in the 46th Biennale di Venezia in 1995.